The MRSA staph infection is also referred to as a staph superbuy infection or also methicillin resistant Staphylococcus aureus infection. These are terms that have been assigned to a strain of staph that is resistant to many infection-fighting antibiotics such as methicillin. The infection is caused by the Staphylococcus aureus bacteria. Because of the high resistance to many antibiotics that fight staph infections, this condition is very dangerous and can be fatal. This superbug is particularly a problem for the elderly or people with weak immune systems. However, nowadays, MRSA can affect even healthy people. Methicillin resistant staph infections initially were only found in hospitals or nursing homes and were often called HA-MRSA or health care associated MRSA. However, nowadays it can occur outside of these locations as well and the term to describe this form is CA-MRSA or community associated MRSA. Where did the staph superbug come from? There are several theories as to why the staph MRSA superbug has appeared. Many are based on the presence or use of too many antibiotics worldwide. This can be in the food we eat and the water we drink. In some cases this has been done intentionally, such as the use of antibiotics in conjunction with the raising of livestock. In other cases, groundwater gets indirectly contaminated due to runoff. Doctors using antibiotics to treat health conditions that did not require antibiotics in the first place also contributes to overuse. The above scenarios lead to bacteria that develop a resistance to the antibiotics. The bacteria mutate rendering them unaffected by certain antibiotics. Is it possible to successfully treat an infection caused by the staph superbug? Treatments for a MRSA staph infection depends on the severity of the staph problem. If a minor infection develops, this can usually be treated at home with antiseptic and antibiotic ointments either prescription or non-prescription. A mild oral antibiotic may also be required and prescribed by a physician, but generally a healthy immune system can combat minor staph infections. Unfortunately, sometimes a minor MRSA staph infection can develop into a more serious skin infection problem. In these scenarios, the symptoms get worse with time and a fever is likely to develop. 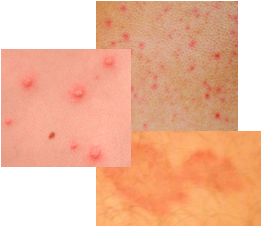 Indications that the infection is spreading might be evident on the skin with the appearance of lines or darker patches near the infected site and spreading away from the site. At this point the infection has moved into the blood stream. If this is the case, then a visit to a physician is a must and should occur immediately because infections may subsequently develop in various organs in the body such as the heart and lungs. A host of other health problems can also result from a staph skin infection that has spread. Staph skin infections can even lead to death. If the staph infection has progressed, then a physician will likely perform a test to determine the strain of the bacteria and to see if the staph infection is of the antibiotic resistant type or MRSA (methicillin resistant Staphylococcus aureus). The results will determine which antibiotics should be used. This is important information to know because if the infection is MRSA then standard antibiotics will be ineffective against the infection and the infection will progress even though you believe that your are successfully treating it. MRSA is difficult to treat. Powerful antibiotics and finding the right antibiotics and treatment regime are keys to combat MRSA. Often the antibiotics are given intravenously for rapid and maximum effectiveness. In most cases, a proper antibiotic treatment can be found and the infection cured, especially if the infection is not well advanced. Treatments of a MRSA staph infection with antibiotics are a moving target. This is because the bacteria adapt to antibiotics and mutate and become resistant to them. Therefore, new antibiotics or different antibiotics that previously were effective are often needed to cure the infection. Pain relievers can be used to ease the pain caused by the infection. Pus can be drained from the site by applying warm compresses to the affected areas. This can be discussed with the physician. A MRSA staph infection might require surgery as the treatment option. For example, if the staph infection has progressed deeply into the skin or even into the muscles, then surgical clean-up and pus drainage are required.